This approach was suggested in the course of our interviews with drug sponsors. 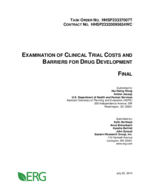 If FDA can successfully encourage sponsors to utilize lower-cost facilities (such as local clinics and pharmacies) for data collection purposes whenever possible, the need for costly infrastructure and overhead can be reduced. Furthermore, sponsors could conduct follow-up visits beyond the initial trial period at local centers to minimize travel and time costs for participants and thereby possibly improve retention. A related option is conducting web-based trials, in which patients can participate from home using computers and smartphones rather than traveling to trial sites. Pfizer has attempted this “clinical trial in a box” idea, recruiting patients through Internet advertisements and providing a website that explains the trial and allows online enrollment. All necessary materials (including the blinded study drug and a mobile app for electronic patient-reported outcomes, or PROs) are sent to participants at home (Silverman, 2011). If it is more convenient for patients to fulfill trial requirements, they may be more willing to participate in studies. Therefore, one important effect of this approach is shortened enrollment timelines. Clinical Resource Network (CRN) is a provider of services that allow investigative sites to have tests conducted at a subject’s home rather than requiring the patient to be on-site. CRN reports that these services can reduce projected enrollment times from approximately 12 months to 3 months, a reduction of 67 percent (Shapiro, 2008). We searched for additional literature on what portion of trial time is attributed to enrollment in order to reduce it by 67 percent for Phases 1, 2, and 3 to model this approach. One study reported that at least three years are spent on patient recruitment (Marks & Power, 2002). We assume that this refers to Phases 1 through 3 and divide it equally such that one year is attributed to recruitment in each phase. This is consistent with the 12 months reported by CRN. This year spent on recruitment, reduced by twothirds, becomes one-third of a year. The reduction, 0.67 years, is divided by the typical length of each phase to get a percent reduction that is specific to each phase and therapeutic area. It is likely that phase time length is not the only parameter in our model that would be affected by this strategy. Depending on the specific characteristics of the approach chosen, there may also be impacts on: data collection, management and analysis costs, patient recruitment costs, patient retention costs, RN/CRA costs, physician costs, clinical procedure total, number of planned patients per site, site recruitment and retention costs, site management and monitoring time periods and costs, project management costs and time, administrative staff costs, and number of sites per study. If the user wishes to test more clearly defined approaches of this type, he/she can enter custom values for these fields to reflect the relevant changes. Table 9 presents the cost savings attributable to this mitigation strategy, which are fairly sizeable especially in Phase 2 and Phase 3. The savings that could potentially be realized range from $0.1 million (dermatology and endocrine) to $0.8 million (immunomodulation and respiratory system) in Phase 1. In Phase 2, the potential savings range from $0.8 million (cardiovascular) to $4.3 million (hematology). For hematology, these savings are substantial representing 22 percent of study costs. Similarly, savings range from $0.9 million (gastrointestinal) to as high as $9.1 million (pain and anesthesia) in Phase 3 studies.